Candid shot, Dorothy Nadeen second from left and Pansy on the far right, daughters of Ray Noyes and Bettie Brewer Noyes. The other two women are unidentified. Spring or summer, all are in short sleeved, lightweight, print dresses, Pansy with a scarf about her head resting against a bench. Wind is blowing fiercely and perhaps they have been at a picnic which is wrapping up as some are holding their purses. It’s difficult to tell if Dorothy has removed a shoe and is perhaps shaking a stone out of it. A girl can be vaguely discerned in the background. I’m guessing this image is from the 1940s and that it was likely taken in Liberal, Missouri. The woman on the far left with her back to the camera is my mother, Eula Millard Noyes, second wife of Ray James/Jamie/James Ray Noyes, only son of Bettie and Ray Noyes. According to our immediate family lore, my parents eloped after knowing each other only a few weeks, meeting when he broke the window to her car becasue she had locked her keys in the ignition. My recollection is that they were married in Greenfield, MO but I have not been able to find any direct records of that. They were accompanied by his sister and husband, Mary Lou Noyes and Phillip Hurt, and Mom spoke of walking down the stairs of the Noyes homestead (located southeast of Liberal) the next morning to meet her in-laws for the first time. I don’t have their marriage date but it was in the early 30’s. While the family records here in this site identify my father as Ray James, I only knew him to be called Jim, Jamie by his immediate family, or J.R. 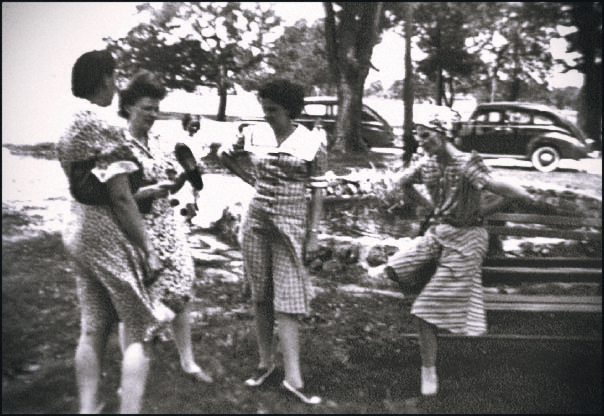 If I were to guess the identity of the other woman in the middle of the photograph, it would be my Aunt Cora, his sister who lived in Shreaveport, LA. With the graininess of the scan, it is difficult to be sure. Sue, I had gotten the info off the family bible pages. (I don’t have the original. Hape the copy below.) I have a date for you. Nov 17 1933 at Greenfield MO Friday. Ray James Noyes was born near Liberal MO Sat Aug 8th 7 oclock 1903 12 lbs. Thanks for these stories and for identifiying Eula, and possibly Cora. I’m happy to hear from you! Thanks for the info. I’ve enjoyed looking at this site.